Welcome to the Litchfield Cemeteries web site. The purpose of this site is to provide basic cemetery information and pertinent notes so individual researchers will not have to “reinvent the wheel” by tracking down the same material that others have already found. Directions given below begin at the intersection of Routes 9/126, which runs more or less east-west, and Hallowell Road, which runs north-south. This intersection, known as Batchelder's Corner or Batchelder's Crossing, is just south of the Litchfield post office. Cemetery names follow a map provided by the Litchfied town office. 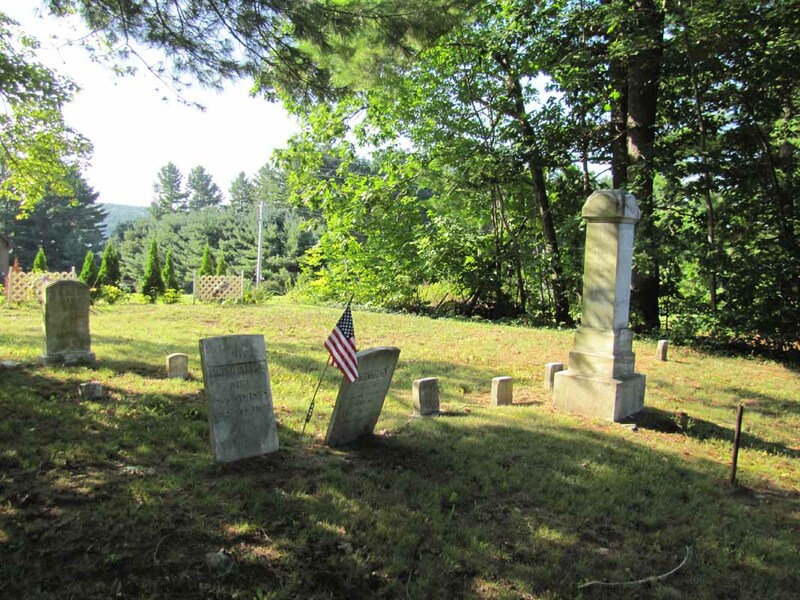 All information, especially source material, for inclusion in this web page should be sent to info@vfthomas.com or mailed to “Litchfield Cemeteries” at the address at the top of this page. Below is an alphabetical list of Durham's cemeteries. Click on any name and you will be taken to an entry for that cemetery. Directions. From the intersection described above, travel south on Hallowell Road, and the cemetery is along the right side of the road in 0.1–0.2 miles. Directions. From the intersection described above, travel west on Routes 9/126 0.7–0.8 miles to the intersection on the left with Huntington Hill Road. Follow Huntington Hill Road 1.6–1.7 miles to the intersection on the right with Buker Road. Follow Buker Road 1.2–1.3 miles to the intersection on the left with Oak Hill Road. Turn left onto Oak Hill Road, and the cemetery is at the back of a high field on the right in approximately 0.3–0.4 miles. Note: As you approach the Cemetery, look to your right for a separate lot for a Dennison family (UTM: 19T 0420848, 4891656; Lat./Long. : N 44°10′25.8″ x W 69°59′24.5″). Directions. From the intersection described above, travel north on Hallowell Road approximately 1.9 miles to the intersection on the left with Hardscrabble Road. Turn left onto Hardscrabble Road and in less than 0.1 miles turn left onto Whippoorwill Road. Follow Whippoorwill Road, and the cemetery is along the left side of the road in 1.0–1.1 miles. Directions. From the intersection described above, travel east on Routes 9/126 less than 0.1 miles to the intersection on the right with Dennis Hill Road. Follow Dennis Hill Road approximately 0.6 miles to the intersection on the right with Pine Tree Road. Follow Pine Tree Road, and the cemetery sets back from the left side of the road in 0.5–0.6 miles. Directions. From the intersection described above, travel south on Hallowell Road approximately 2.5 miles to the intersection with Libby Road (to the right) and Plains Road (to the left). Turn left onto Plains Road, and the cemetery entrance is on the right in 0.2–0.3 miles. Directions. From the intersection described above, travel south on Hallowell Road 4.2–4.3 miles to the intersection with Route 197. Turn right (east) onto Route 197, and the cemetery is on the left in 2.4–2.5 miles. Directions. From the intersection described above, travel west on Routes 9/126 0.7–0.8 miles to the intersection on the left with Huntington Hill Road. Follow Huntington Hill Road 1.6–1.7 miles to the intersection on the right with Buker Road. Follow Buker Road 1.2–1.3 miles to the intersection on the left with Oak Hill Road. Turn left onto Oak Hill Road, and the cemetery is along the left side of the road in 2.6–2.7 miles. Directions. From the intersection described above, travel south on Hallowell Road approximately 2.5 miles to the intersection with Libby Road (to the right) and Plains Road (to the left). Turn left onto Plains Road and follow it approximately 2.6 miles to the intersection on the right with Upper Pond Road. Turn right onto Upper Pond Road, and follow it 1.4–1.5 miles to the intersection with Route 197. Turn left onto Route 197 and follow it east approximately 1.1 miles to the intersection on the right with Dead River Road. Turn right onto Dead River Road and follow it 0.3–0.4 miles to the intersection on the right with South Adams Road. Turn right onto South Adams Road and follow it 0.3–0.4 miles to the intersection on the left with South Greenleaf Woods Lane. Turn left onto South Greenleaf Woods Lane, and the tomb sets back from the right side of the road in less than 0.1 miles. When leaves are absent, the tomb can be seen even before turning onto South Greenleaf Woods Lane. Directions. From the intersection described above, travel south on Hallowell Road approximately 2.5 miles to the intersection with Libby Road (to the right) and Plains Road (to the left). Turn left onto Plains Road and follow it approximately 2.6 miles to the intersection on the right with Upper Pond Road. Turn right onto Upper Pond Road, and the cemetery is along the left side of the road in 0.5–0.6 miles.